The names ascribed to Goa of the ancient times are myriad, and suitably signify the lush greenery one naturally identifies with the tiny state. Gomanta, Gomanchala, Goparashtra, Govapuri and Gomantak are a few which occur in the Mahabharata, Skanda and other Puranas. The syllable ‘Go’ that occurs consistently in all the names is Sanskrit for cow. The Mahabharata also refers to Goa as Govarashtra and Goparashtra. Both mean ‘the district of cowherds or nomadic tribes’ and indicate the pastoral life led by the Aryans who first settled here. Gopakapattana and Gopakapuri can be found in Harivansa and the Skanda Purana, ancient Hindu texts. Ptolemy mentions that in the third century B.C. Goa was known as Aparanta. Epigraphical evidence points to Goa’s trade relations with the ancient Egyptians, Phoenicians and Greeks. Goa may be the Gubi mentioned in the records of Gudea (2143-2124 B.C. ), the ruler of the Sumerian city-state of Lagesh. In the Middle Ages, Goa was called Kuve or Kuwa by Arab traders and Persian writers. Writers like Ibn Batuta have mentioned Sindabur in reference to Goa. Of course, this could be a corruption of Chandrapur, the capital of Goa at the time. Chintabor and Cintabor also occur in 14th century European documents. While the Kadambas are supposed to have referred to Goa as Kalyan Gude meaning ‘abode of welfare’. There are various theories as to how Goa obtained her present name. Portuguese historian Diaogo do Couto traced it to Goemoat, said to be the local word for ‘fertile and refreshing land’. However, no lexical evidence is present to support this claim. Another Portuguese writer believes that ‘Goa’ is derived from the name of an early Kadamba ruler, Guhalladeva. The theory linked to the Parasurama legend surmises that Gomant is the root word for Goa and it taken to mean ‘the resting place of the arrow which was shot’. The creation of this fecund land of abundance is attributed to Parasurama of Hindu mythology. The legend is found in the Sahayadri Khand of the Skanda Purana. Parasurama was the sixth avatar of Vishnu and the son of Jamadagni, a direct descendant of Brahma. King Kartavirya stole Kamadhenu, the bountiful cow, which was in the care of sage Jamadagni. Parasurama then retaliated by killing the king. It is said he exacted revenge against the Kshatriyas after his father was murdered by the sons of King Kartavirya. Sources will tell you that Parasurama faced banishment from the lands he had conquered from the Kshatriyas and so sent seven arrows flying from the top of the Sahayadris to push back the sea and expose land. The sea god is said to have submitted to Parasurama as he claimed this region called Shurparaka (winnowing fan) as his own. This reclaimed land came to be known as Parasurama Kshetra and was divided into seven sectors. One of the sectors was called Govarashtra which is identified with Goa. The legend is a reference to the elevation of submerged land along the west coast. This geological process is said to have taken place 12,000 years ago and it validated by the marine fossils, buried seashells, sand and other features consistent with reclaimed topography. After the slaughter of the Kshatriyas, Parasurama is said to have brought ten great sages to this land to perform the Ashvamedha sacrifice and then gifted the land to them. Thus, 96 Brahmin families who came from around Tirhut made their way to Goa because of Parasurama. Of these 30 settled in Tiswadi (thirty villages) and the rest began to live in Sashti (sixty six villages). This significantly points to the Aryanisation of Goa. These were the ancestors of the Gaud Saraswat Brahmins. They were unique for the fact that they consumed fish which was forbidden to Brahmins. Their origins can be traced back to the Aryans who settled around the River Saraswati in the Punjab. A famine in the region had forced the Brahmins to eat fish. The indigenous inhabitants, who were present in Goa before the Aryan settlers, were called Gowdde. 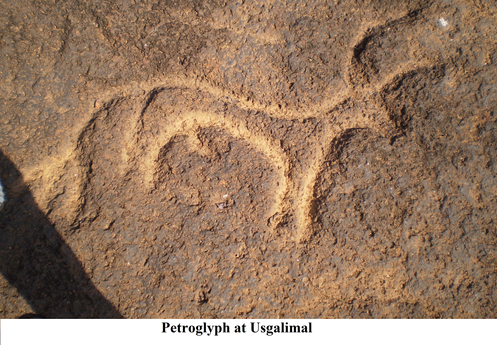 However, the discovery of the petroglyphs of Usgalimal on the banks of River Kushavati by Dr. Nandkumar Kamat and Dr. P.P. Shirodkar, questions the legend of Parasurama bringing about the birth of Goa. These petroglyphs have been tentatively dated to 2500-6000 B.C. and belong to the Upper Palaeolithic or Mesolithic Period. There are more than 125 forms found in the area. The local people had referred to the rock art carvings as Goravarakhnyachim Chitram or ‘pictures made by the local cowherds’. 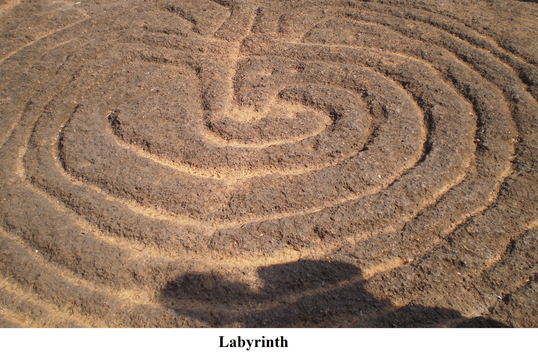 Later, rock art carvings were found at Kazur in Quepem, Mauxim in Sattari and Virdi in Sawantwadi. Differing from many other scholars, Dr. Nandkumar Kamat asserts that these petroglyphs are evidence of shamanistic art of prehistoric times. He believes that the shamans may have consumed mind altering substances that caused them to visualize the geometric patterns they then carved into the bank. It is a scientifically proven fact that the human optic system can evoke incandescent geometric forms when the individual is in a trancelike state. Deeply embedded in most of these petroglyphs is the belief system and rituals of the hunter-gatherers. To the people of the Kushavati culture, the cosmos consisted of three levels. The first would be the material level with zoomorphic and phytomorphic representations i.e. animal and plant representations with divine connotations. The second, the spiritual underworld, would be reflected through anthropomorphic representations (human form or characteristics are given to anything other than a human). And the third, the spiritual realm above the Earth, was illustrated with geometric forms, a labyrinth, cupules (hemispherical petroglyphs) and other elaborate patterns.